Rasoi Magic Mutton Rogan Josh is an authentic curry of India. It is a type of curry which has medium spices with hearty and rich taste. It is the product of Kashmir region which is found in India. Its taste varies with the type of making. Rasoi Magic Mutton Rogan Josh is almost also old as the history of Mughals in Sub-continent. It was brought in Kashmir by the Mughal Cooks. Rasoi Magic Mutton Rogan Josh is a Persian word which means heating something in oil. It is normally used with meat. With the increasing demand of Indian food all over the world, many food manufacturers and restaurants have started to provide Indian recipes, dishes, cooking pastes and curries in other countries to satisfy the need of the Asian food lovers. Rasoi Magic has introduced Rasoi Magic Mutton Rogan Josh. It is 100% original recipe of the Mughals and has been made after the selection of original and healthy ingredients. 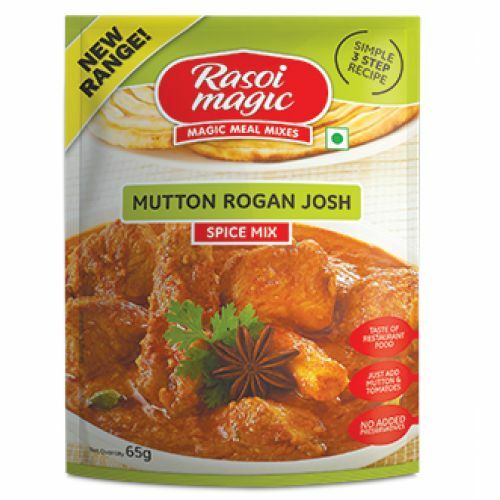 Rasoi Magic Mutton Rogan Josh is perfect to use with meat. It is a medium spice curry which makes every meat dish equally tasty. Rasoi Magic Mutton Rogan Josh is used with many food especially related to chicken, meat, beef and lamb. It gives equal quality of taste on any kind of meat and even vegetables.